The New Brunswick Anti-Shale Gas Alliance provides the following statement about the report issued last Friday by the New Brunswick Commission on Hydrofracturing. 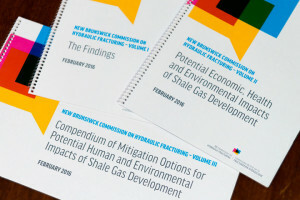 The Commissioners recognized that the discussion about shale gas had to be looked at in the contexts of the immediate need to combat climate change, the lack of a coherent and forward-looking energy policy for the province, and the inadequacy of current institutions and procedures in New Brunswick to deal with either shale gas or with the new realities of a low-carbon world. Accordingly, they laid out a series of recommendations to transition to that new world. While these recommendations are based on the shale gas experience, they are applicable to all energy and natural resource policies. All policies must consider the impacts on climate change before proceeding, and must guarantee the ‘long-term viability’ of our water and energy resources. Environmental and energy policy should lead us into the new value-added and knowledge-based economy. The relationship between governments and First Nations must be rebuilt from the ground-up on a nation-to-nation basis. Discussions with First Nations, municipalities and citizens, especially those bearing the risks, must be based on the two-way flow of objective and scientifically valid information in order to do a valid risk/benefit analysis and to ask for social license. A Health Impact Assessment must be included with the Environmental Impact Statement. Both must examine cumulative effects over space and time, and look beyond a particular project in isolation. The mapping of aquifers and baseline data, such as water quality, air quality and health conditions, must be established before any development begins. Likewise, plans for ongoing scientific monitoring of air, water and health must be made for the life of the development. These and other recommendations require fundamental changes and will take time, trust and work to accomplish, but the Commission notes that there are no shortcuts. The Commissioners recognized that due to the dismal economic state of the gas market we have the time, as it will be a number of years before shale gas ‘may’ become economical again. In this we disagree with the Commission, as the economics of shale gas have deteriorated even further since its report went to press. Because of this – and the remarkable growth of clean energy technology – we believe that any economic case for shale gas will be eclipsed by the swift clean energy response to climate change. As in any report of this size, there are some statements, assumptions and details with which we disagree. But, as to its conclusion that we need to leave behind a 20th century economy based on finite supplies of fossil fuels that can no longer be burned, we are in total agreement. The government’s decision to impose a moratorium was prompted in great part by anunprecedented and united grassroots movement. Events since then, including the growing urgency of addressing climate change, the collapse of oil and gas prices, and the huge growth and decreasing costs of renewable energy, shows the decision was correct. The Commission Report provides reasons to strengthen that decision further by making it permanent. NBASGA appreciates the thoughtful approach the Commission has taken in fulfilling its mandate. Following its recommendations would enable New Brunswick to join the rest of the world in moving toward a future that will provide jobs, while protecting the health of our environment, ourselves and our communities. We would much prefer this road to a legal challenge over a declining industry. Posted in: Clean Energy, climate change, Fracking & Health, Fracking and Economics, Fracking News, Moratoria, Social License.